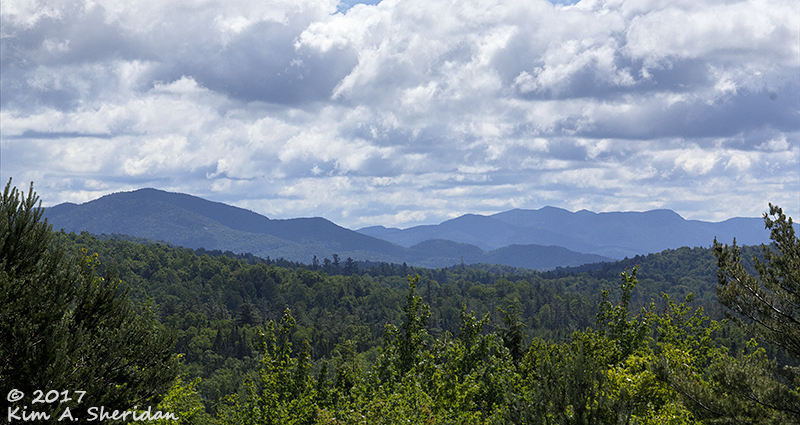 My friends and I all had things we wanted to see and do in the Adirondacks. 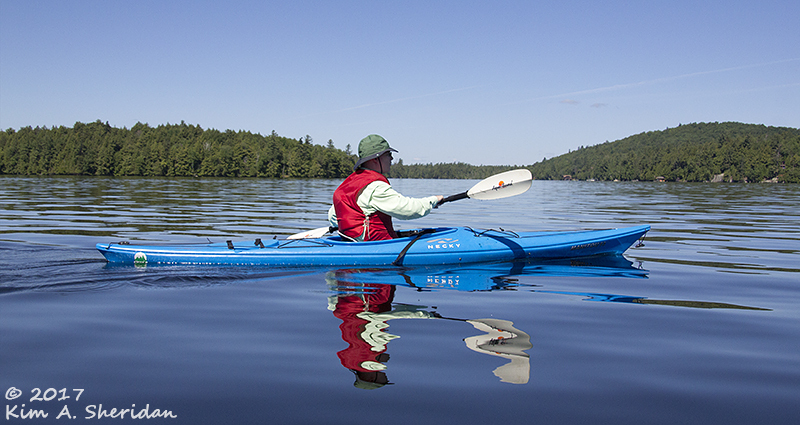 I wanted to kayak at sunset, and capture images of waterfalls and Common Loons in summer plumage. Don wanted to see a moose. Robb just wanted to take a walk on the wild side. The Wild Walk at the Wild Center in Tupper Lake, that is. The Wild Center is a natural history education center with trails and a large exhibit space. 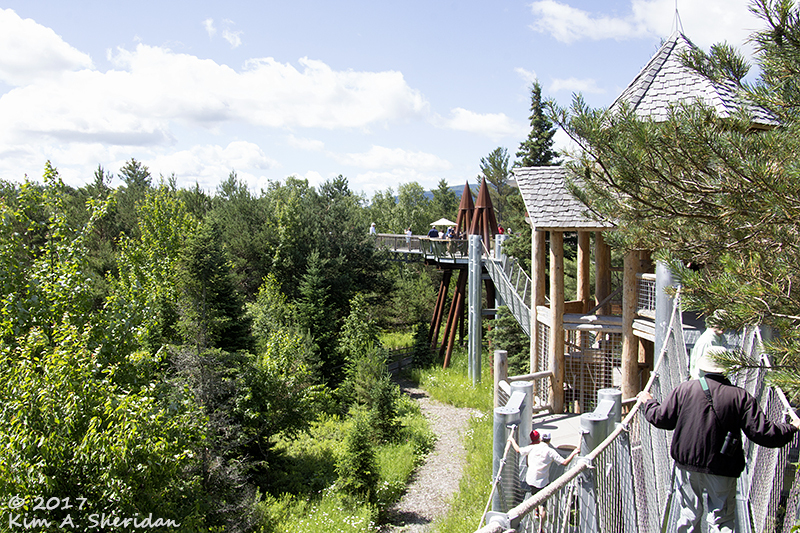 The highlight is the Wild Walk, a trail across the treetops, designed to show visitors the Adirondacks from the perspectives of different animals. There’s a spider web, an eagle’s nest, and an old hollow tree with a staircase inside, all connected at various heights off the forest floor. Just Robb’s cup of tea. The views over the top of the forest to the mountains beyond were amazing. 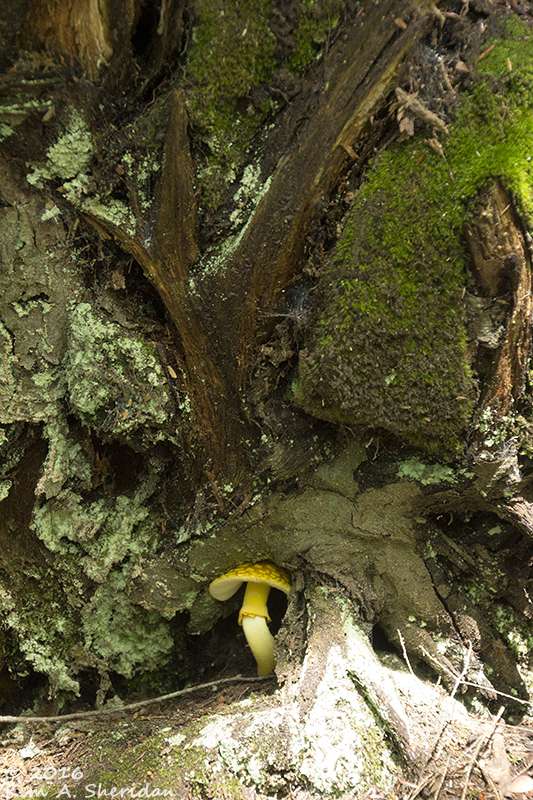 We took a walk on the forest floor, too, and found tiny mushrooms sheltered in the base of an old tree. 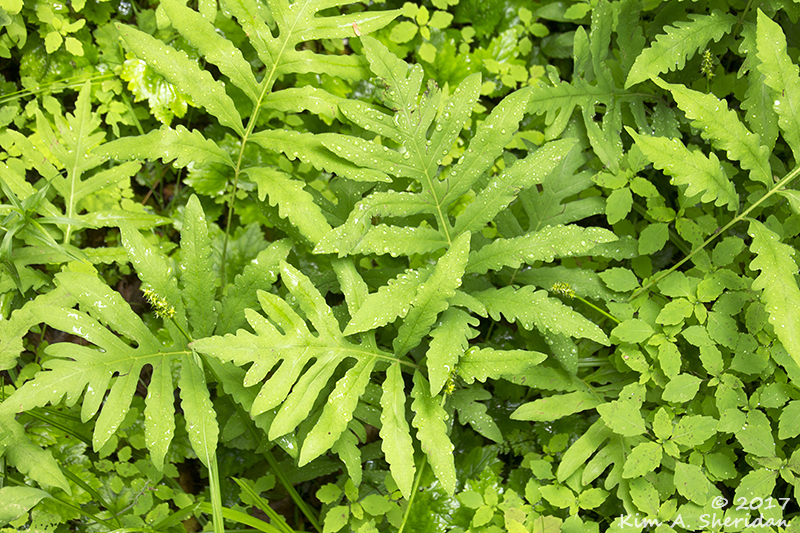 Sensitive fern – my favorite fern. Yes, I have a favorite fern. Robb is partial to maidenhair. 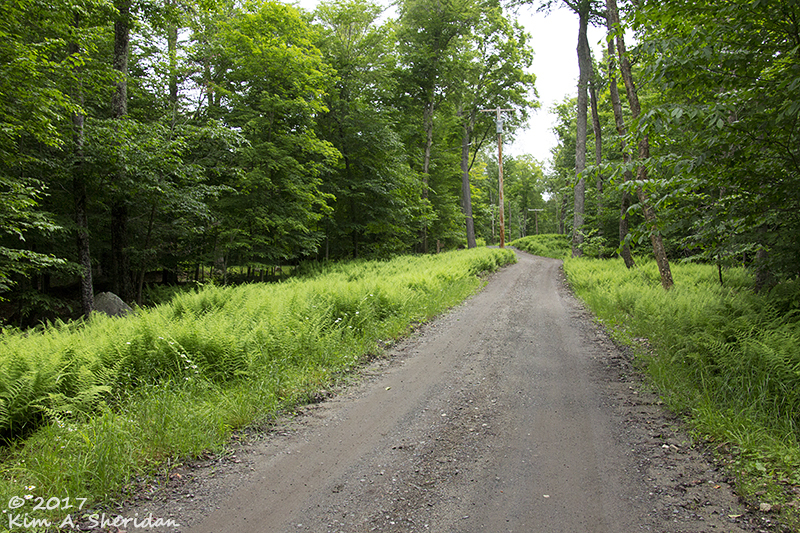 The forest understory in the Adirondacks was carpeted by ferns, ferns and more ferns. 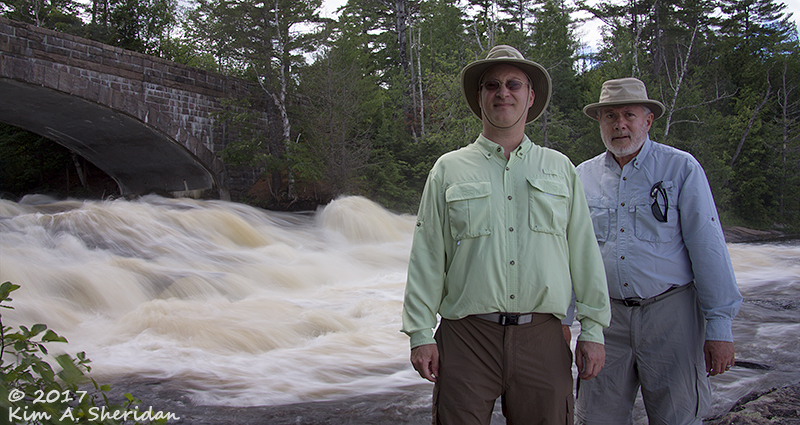 After lunch, we explored Bog River Falls. 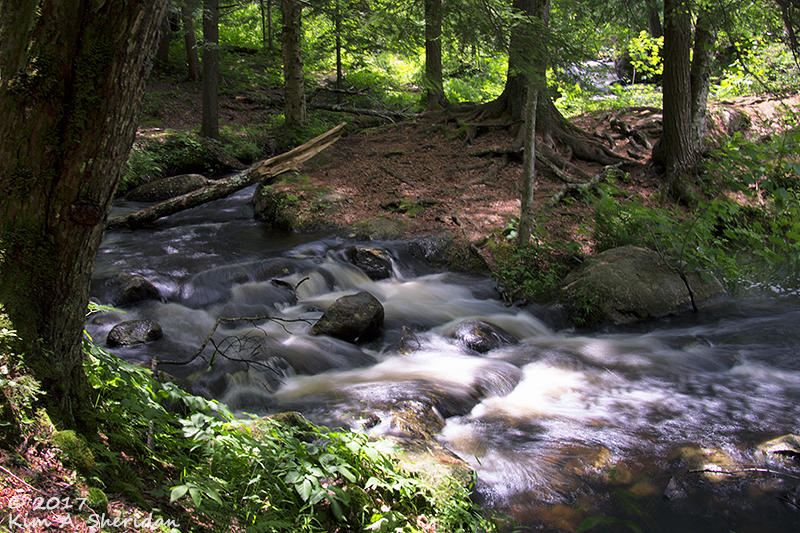 Bog River flows through the Horseshoe Wild Forest before tumbling over a set of waterfalls into Tupper Lake. 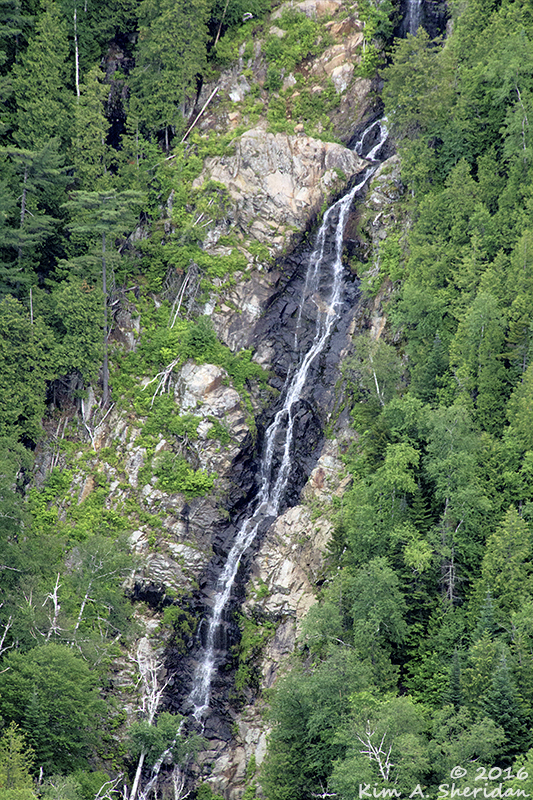 The upper and lower falls can be accessed on both sides of the river. I dug out my tripod and tried my hand at some long-exposure photography. 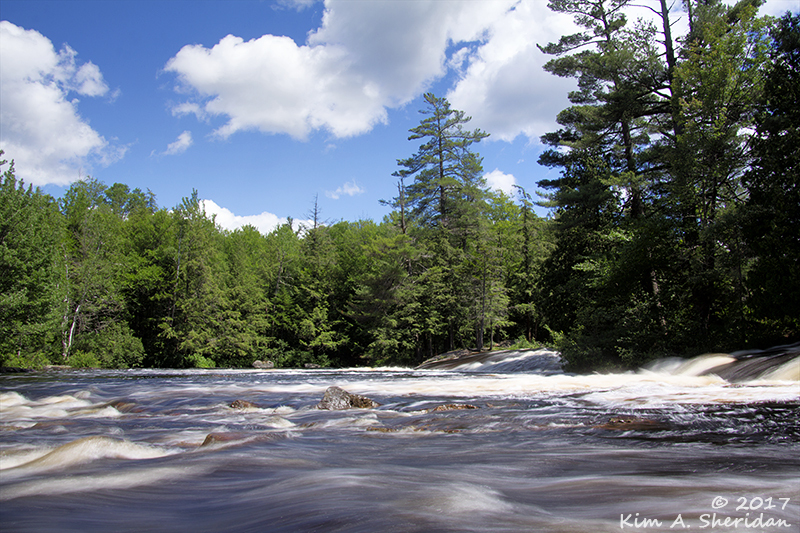 The upper falls split around a tree-filled island. 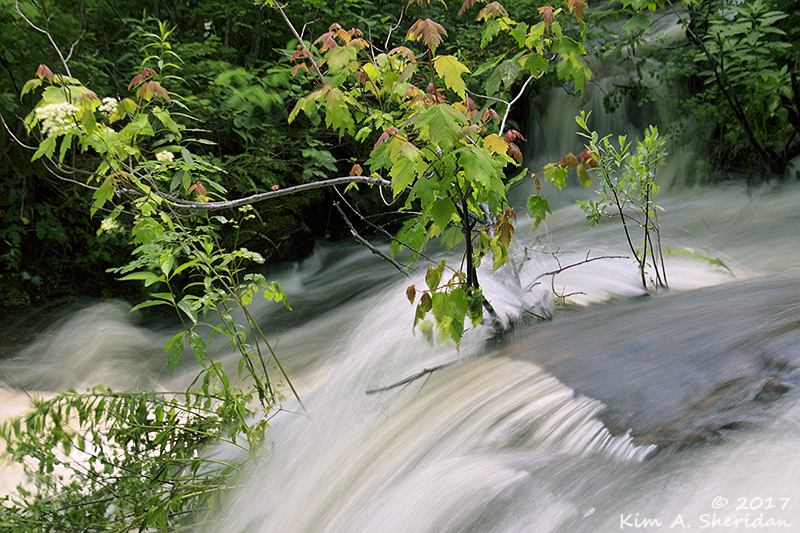 Nearby, small feeder streams cascaded into the Bog River. My compadres on a rocky slab extending out into the lower falls. 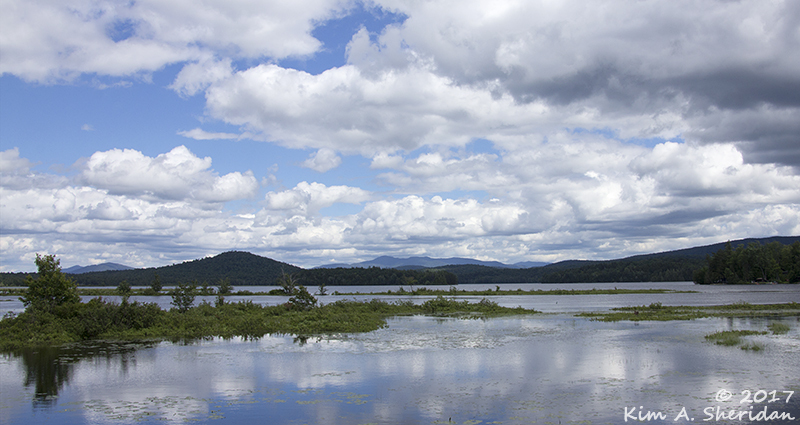 The panorama of Tupper Lake at the top of this post was taken from this same spot. Simon Pond. 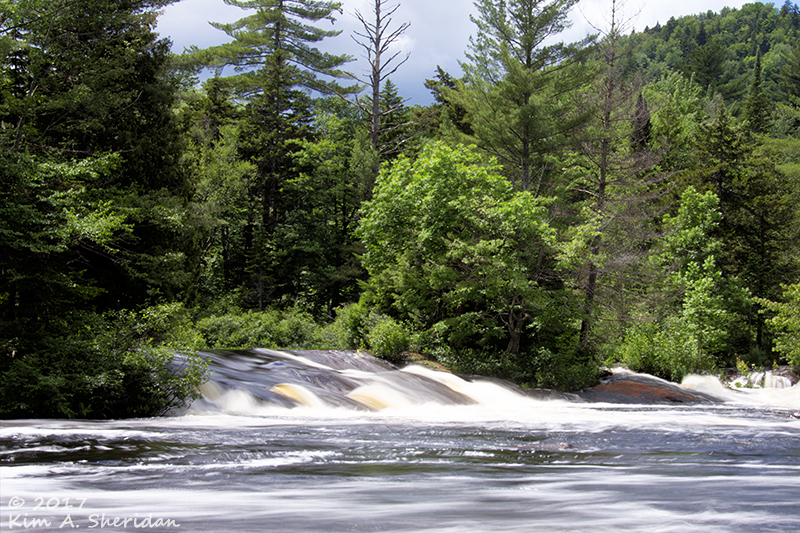 From the tallest treetops to expansive blue lakes, raging waterfalls to peaceful ponds – what a pleasure to be wild and carefree in the Adirondack Mountains. It wasn’t all leisurely repose during our Adirondack retreat. There was serious mountain climbing to do. 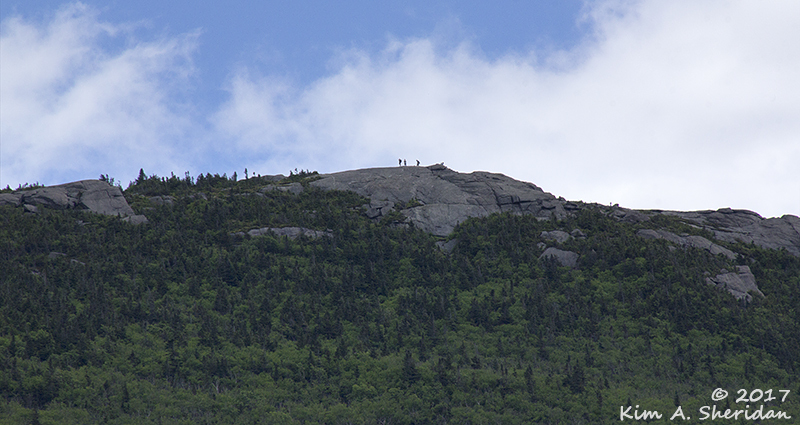 As close as we were to the High Peaks of the Adirondacks region, we couldn’t skip doing a little peak bagging of our own. But which peak? 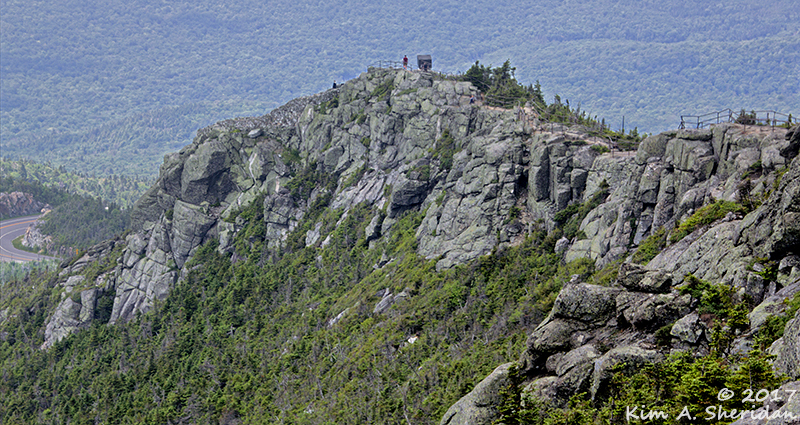 There are 46 High Peaks in the Adirondacks, all 4000’ high or more. 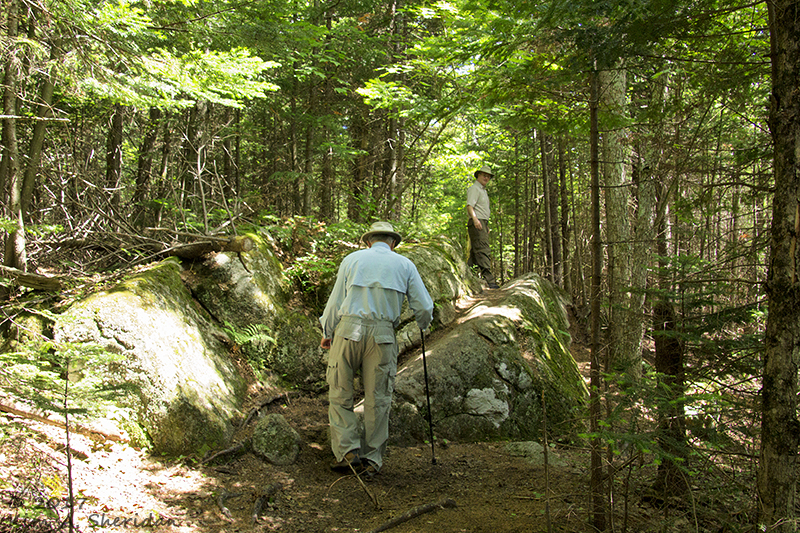 Many of the trails to reach their summits were too long and steep for us to tackle in a moderate day hike. Something in the 3-4 mile range was more our speed. I’d acquired a book called “Best Easy Day Hikes in the Adirondacks.” From that we chose a hike to Balanced Rock on Pitchoff Mountain. 2.5 miles, 775’ elevation gain, with a neat rock formation on an exposed bedrock ridge as the payoff. 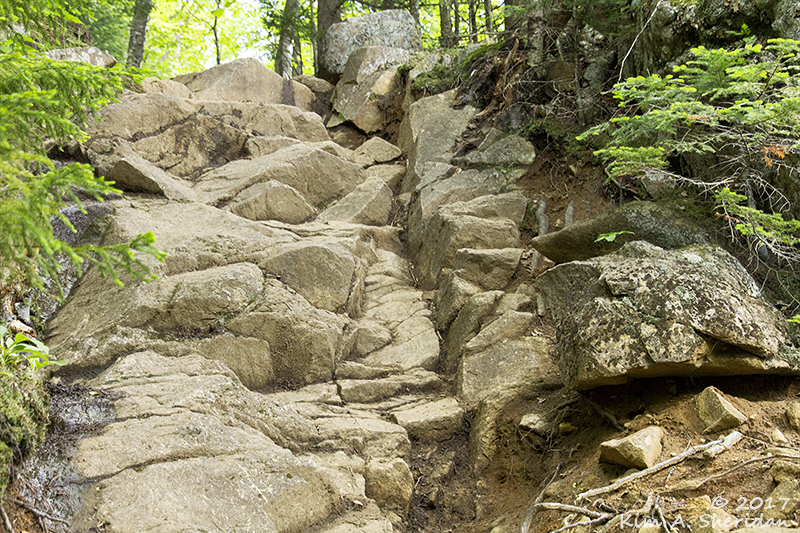 The guidebook described it as the “perfect first hike for kids…” What could go wrong? 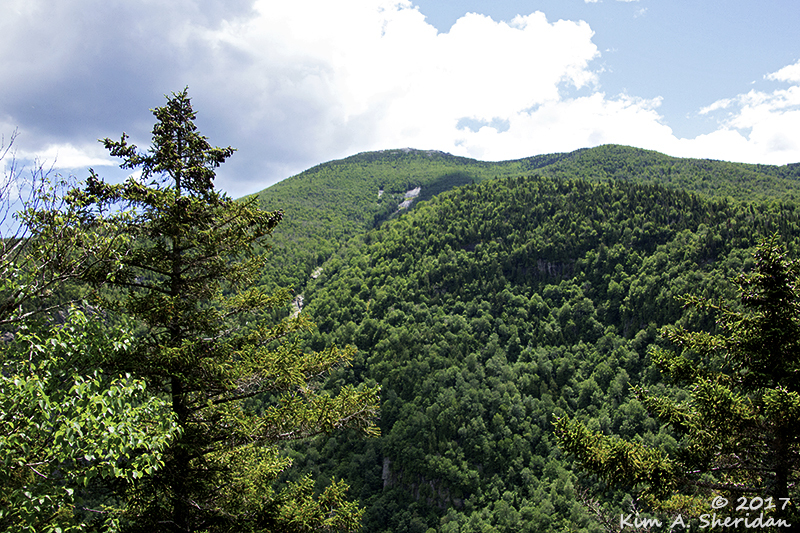 Much of the land in Adirondack Park is designated as wilderness. No powered vehicles are allowed. Pitchoff Mountain, in the Sentinel Range Wilderness Area, would be our first foray into the wilderness. The wilderness areas may be lacking in cars, but that’s because they’re all jammed into trailhead pullouts. Our trailhead was on Route 73, across from Cascade Mountain and upper and Lower Cascade Lakes. We parked precariously along the side of the road, climbed a short steep set of steps, and plunged into the deep, shady woods. If you’re not the lead horse, the view never changes. Don and Robb walking up the hill. The trail started right off with a good stiff incline, and already I was wondering what we’d gotten ourselves into. 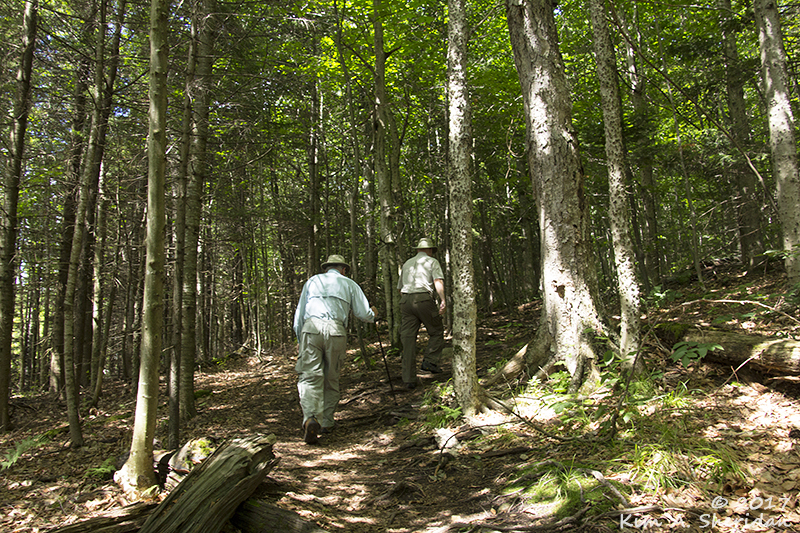 After a bit, the trail leveled out, and became a nice walk in the woods. Birches and hemlocks predominated, amongst other trees. 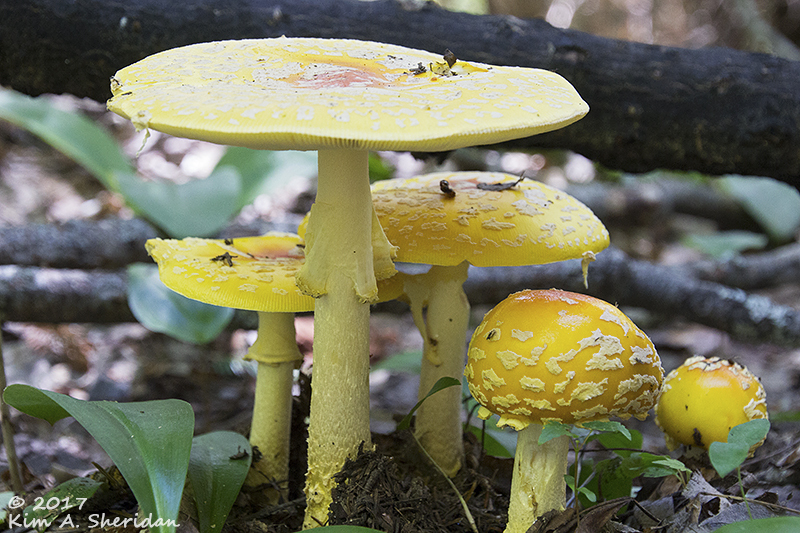 The forest floor was peppered with mushrooms. This is an amanita mushroom, beautiful, but hallucinogenic and poisonous. I’m sure that doesn’t bother the tiny wood sprites that must shelter from the rain under Mother Nature’s umbrellas. Lycopodiums were everywhere. 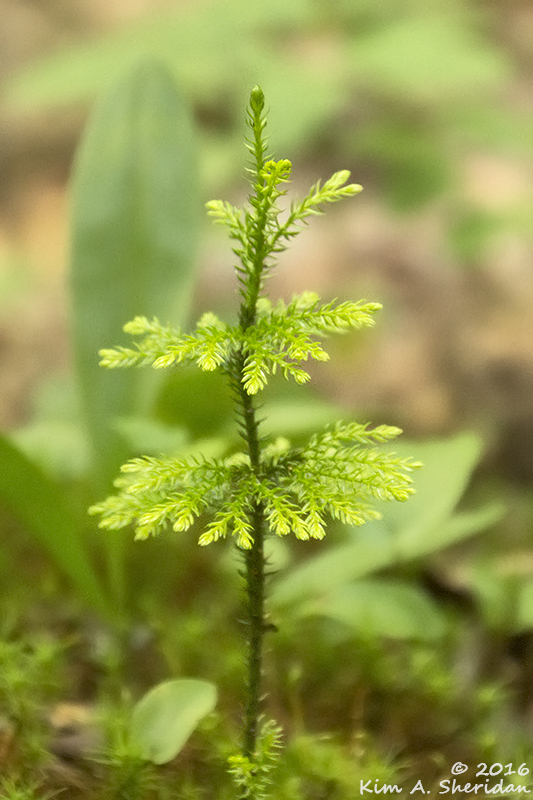 Sometimes called ground pines, these tiny plants look like little Christmas trees, but they’re actually a club moss. We’re quite fond of them, and get excited every time we find them in a new place. There were so many Lycopodiums that our excitement wore off after a thousand or so. Another surprise was finding trilliums, some just past bloom. In our neck of the woods, trilliums are spring ephemeral wildflowers that bloom in late April and early May, after which time the foliage withers and dies away. Seeing them still in leaf in early July was a treat. A few still had old flowers. We passed some rocks on the side of the trail that led to a nice view. Back in the dark depths of the forest, rocks became more numerous and prominent. We really like to scramble over boulders and slabs, so we didn’t mind. Pitched up at a 45° angle, this terraced outcropping offered a fun trail bed. …another view. This is Cascade Mountain. 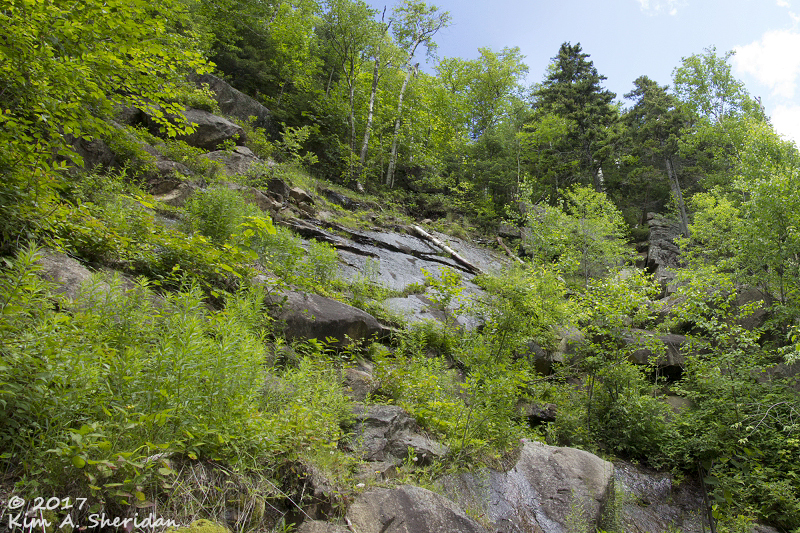 With its sheer cliff faces, it’s a favorite place for rock climbers. Cascade Lake lies far below. Then the trouble started. It had been an easy walk this far. Until we found ourselves confronted by this, which I later dubbed “The Fractured Staircase.” Perhaps 30’ high, with no way around it. To the right is steep rock face, to the left an impenetrable thicket. No way to go but straight up the middle. Not a problem for Robb, who’s part billy goat. The first step gave me fits. It was so tall I had to put my knee on it and pull myself up. The rest of the climb was accomplished carefully with hands, knees and feet. I felt a deep sense of accomplishment upon reaching the top. I also felt out of breath, and would have welcomed a brief rest. But we quickly moved on to the next rocky challenge, and the next. In between the rocky spots, the path grew wet and mucky. These sections had to be negotiated as carefully as the rocks; get too much mud on your boots, and you’d slip dangerously scrambling over boulders. Along the trail, I heard a rustling in the brush to my left. I looked down just in time to spot a large snake, with strongly contrasting light and dark patches. Before I could react, it slithered out of view. I like to imagine it was a timber rattlesnake, though I never did identify it. The rock scrambles grew tougher and steeper. We began to wonder what kind of parent would consider this a “kid-friendly” hike. If I had trouble with some of these tall rocks, how could kids with short little legs manage? 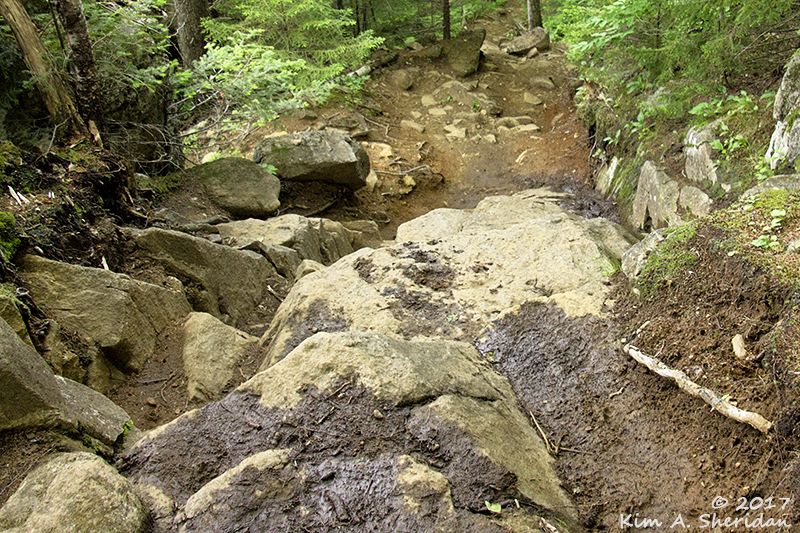 Hopes began to rise when the trail dipped a little – right into a bog. We had to pick our way along fallen logs and stones to avoid getting wet boot soles. On the other side, we saw something that stopped us dead in our tracks. The mountainside didn’t go straight up, but it was darn close. Rock surfaces and boulders everywhere we looked. Oh, dear. We like rocks, but this was ridiculous. 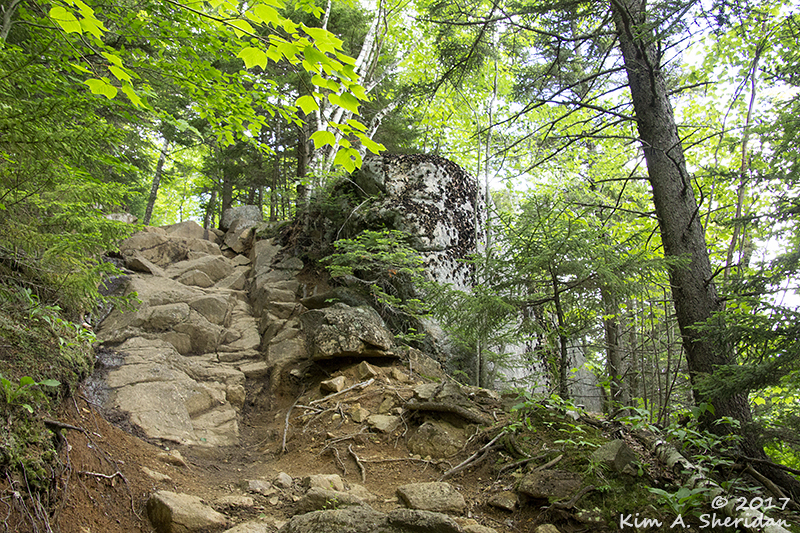 It appeared that the trail to Balanced Rock went straight up the rock face. Kid-friendly? Robb’s a big kid, and he bounded up a few feet to pose valiantly for the camera. Taking pictures gave me a chance to catch my breath for a minute. There was plenty to photograph looking the other direction. Cascade Mountain. Those cliffs were even steeper than what we were facing. Down the face of Cascade streams a slender waterfall, plunging hundreds of feet into Cascade Lake. This was the waterfall that distracted me so driving past that first night. The top of Cascade is wide open bedrock. Topped by peak baggers. 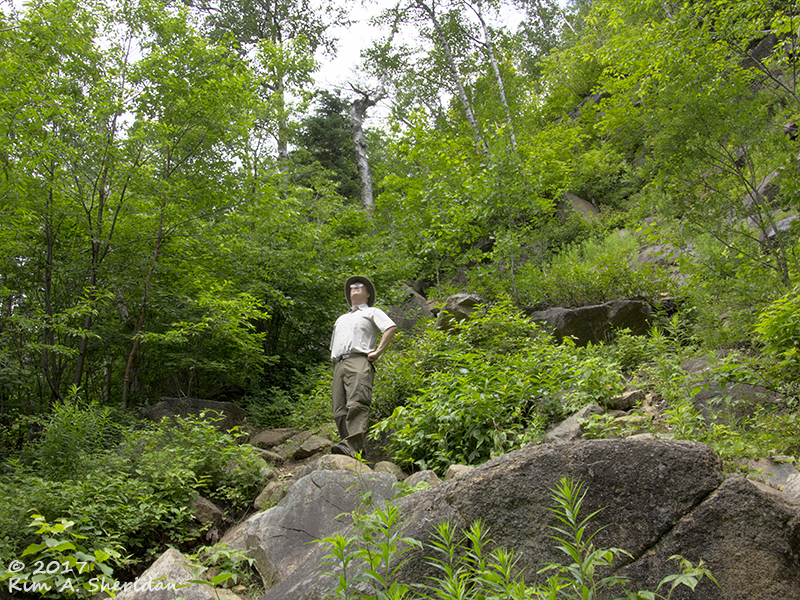 Wide open bedrock is what we’d climbed all this way to see – the open rock and boulder formations at Balanced Rock, covered with wildflowers, lichens and blueberries. 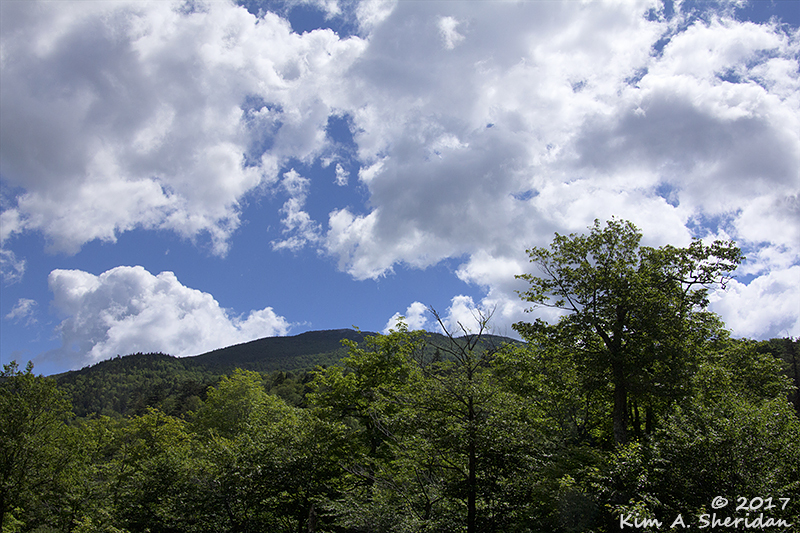 The view of the summit of Pitchoff Mountain itself beyond Balanced Rock, and the surrounding High Peaks, is said to be amazing. But now we were faced with an obstacle too much for Don and I to surmount. We’d been hiking long enough to get tired, though we’d not gone more than a mile. I might have been able to continue after a break, but I knew we’d have to come back down that same rock face. For us, this was the point of no return. Back down the mountain we went. Never let it be said going down a mountain is easy. It’s not; at times I find it more difficult than going up. I was relieved when we came to the Fractured Staircase, knowing it was the last of the truly challenging bits. This is looking down from the top. Kid-friendly? I don’t know about that, but I took my cue from the younger set – and slid down on the seat of my pants. That’s a favorite technique of mine when confronted with a steep hillside. I figure it’s a lot farther to fall from a standing position than a sitting one. I was deeply disappointed to fall short of our goal. Even more, I feel we missed something spectacular at Balanced Rock. But with time, I’ve come to see it not as a big challenge I failed, but a series of smaller challenges I met and actually enjoyed. Don’s always saying it’s about the journey, not the destination. This time, the mountain and the forest were destination enough. Mountains are hard, stony, unforgiving. Nothing comes easily on a mountain. 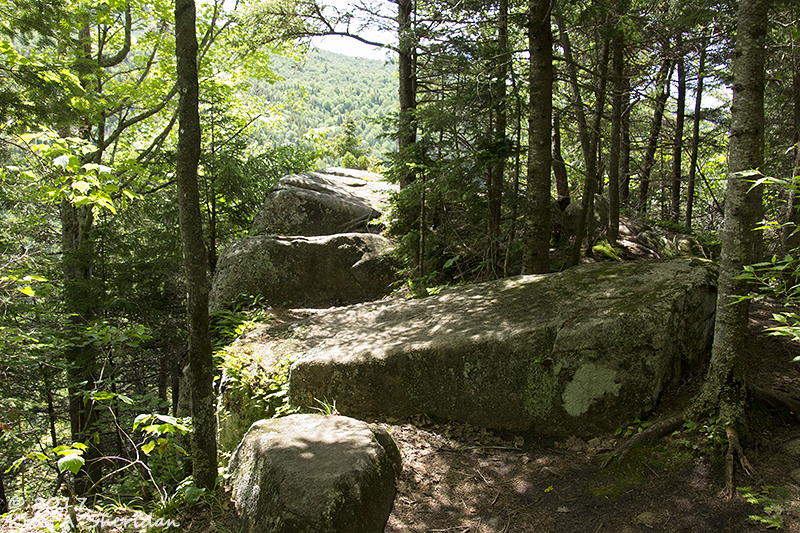 Gentle paths are soon strewn with rocks, small boulders must be climbed, and always the trail goes up, up, up. Until it goes down, and usually that’s worse. No question, mountains are hard work. 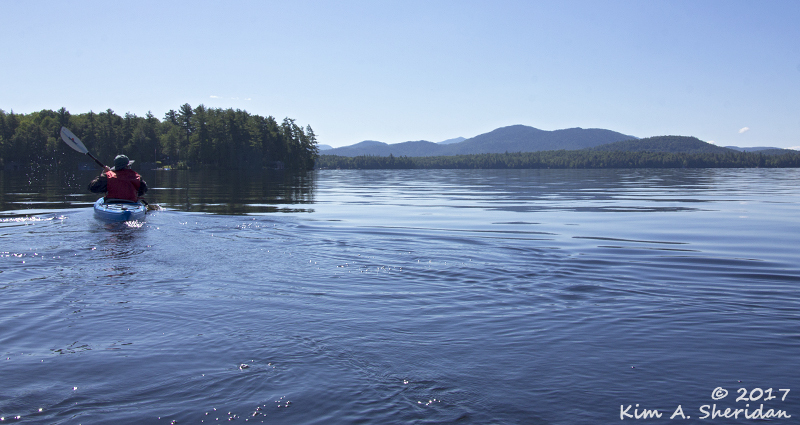 This summer, my friends and I answered the call of New York’s Adirondack Mountains. Forty-six peaks over 4000’. Lots of hiking and climbing and days filled with vigorous activity beckoned. 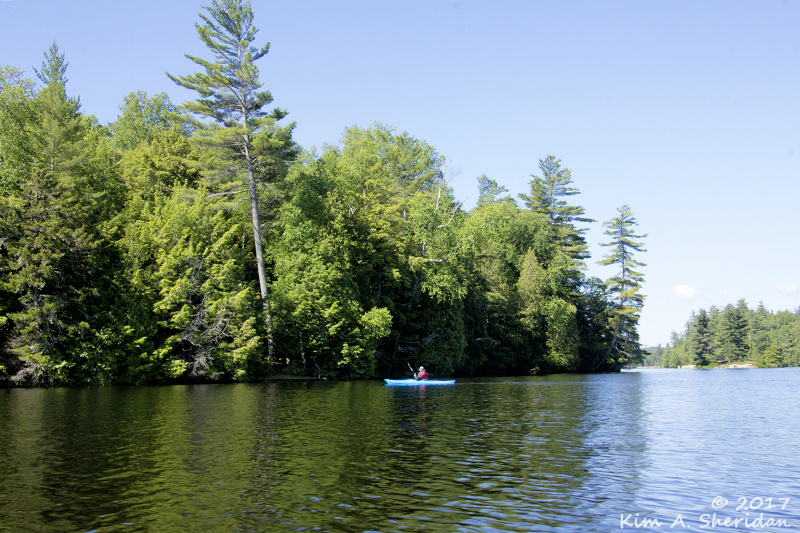 This year’s destination came with a bonus – a lake. Lakes are soft, fluid, soothing. 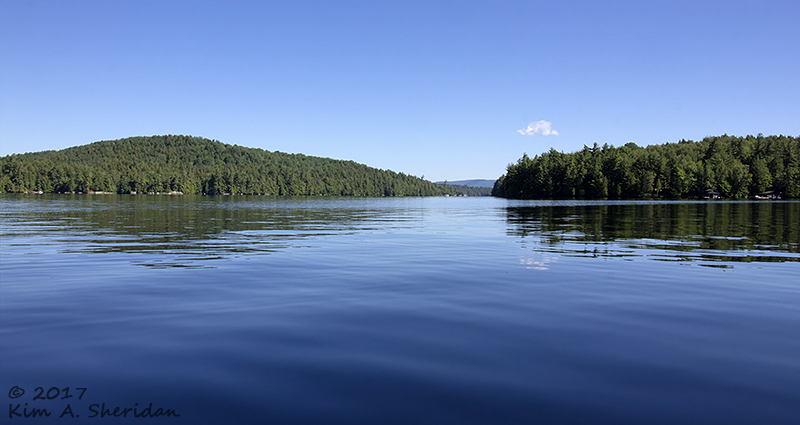 Doing nothing comes very easily on a lake. 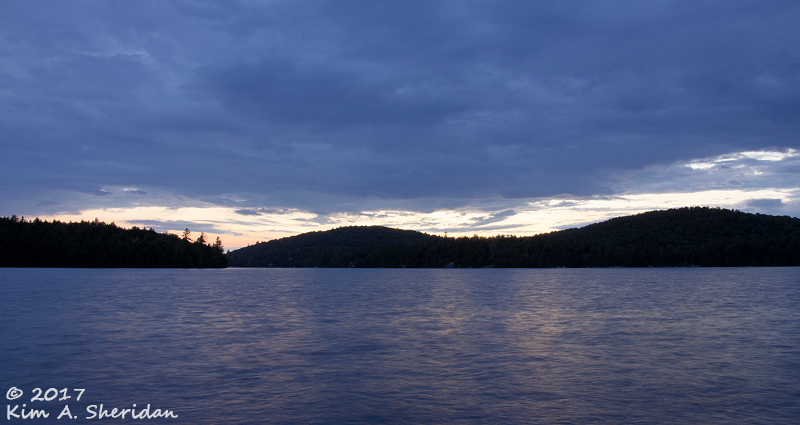 You want to linger, trail your fingers through the cool water, listen to the cry of the loons, soak up the sunset. The living is easy on a lake. This was a BIG lake. 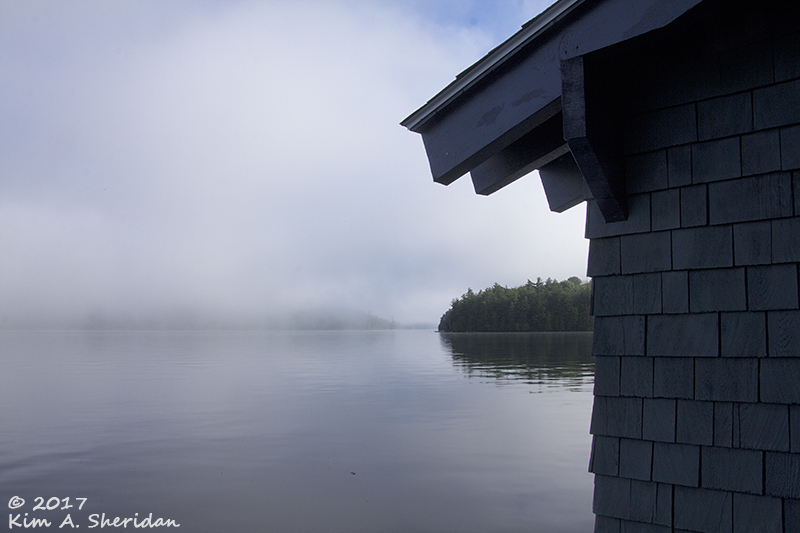 Our rental house perched on the shores of Upper Saranac Lake. With 37 miles of shoreline, that’s a lot of lake. The heck with peak-bagging! We were looking forward to relaxing by the water. It would be restful. Restorative. Carefree. 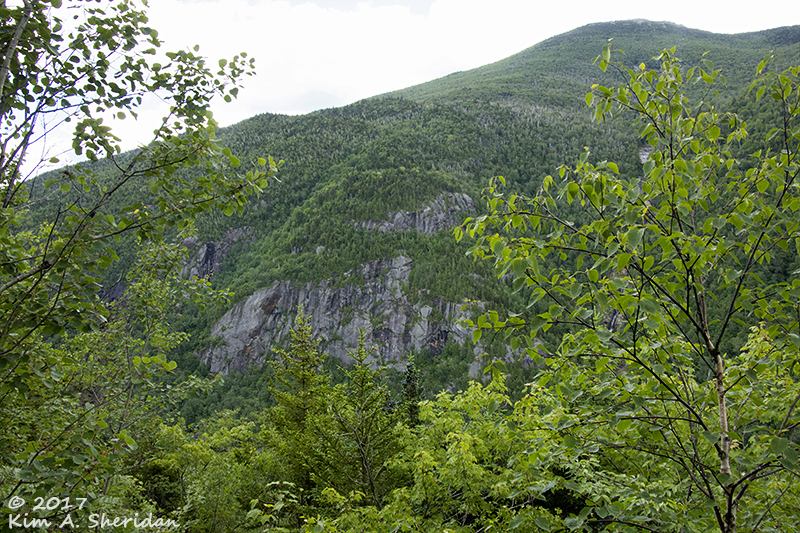 Adirondack Park is a long drive from Philadelphia, north through three mountain ranges. 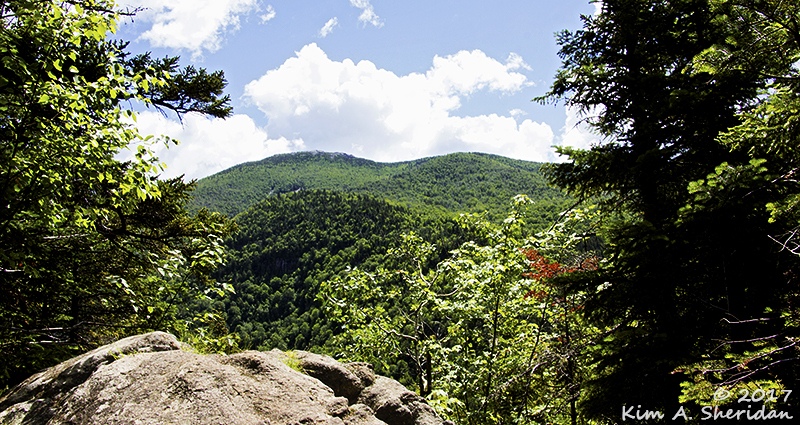 Our own Poconos, the Catskills, and finally the Adirondacks. The High Peaks rose around us, cascading long ribbons of waterfalls into narrow lakes, thoroughly distracting the driver. Concentration returned on the three miles of twisting dirt road that led to our home away from home deep in the woods. Ahhh! 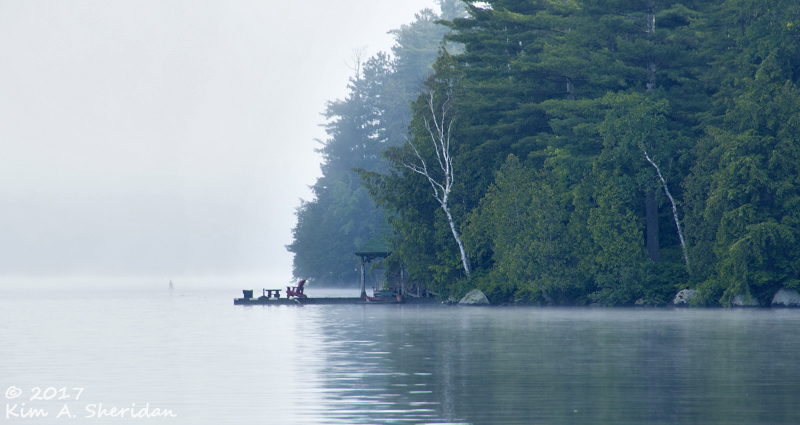 Early mornings on the dock were a joy. With cameras and journal, I settled myself there after breakfast each day, to write and immerse myself in the peace. One morning dawned draped in mist. 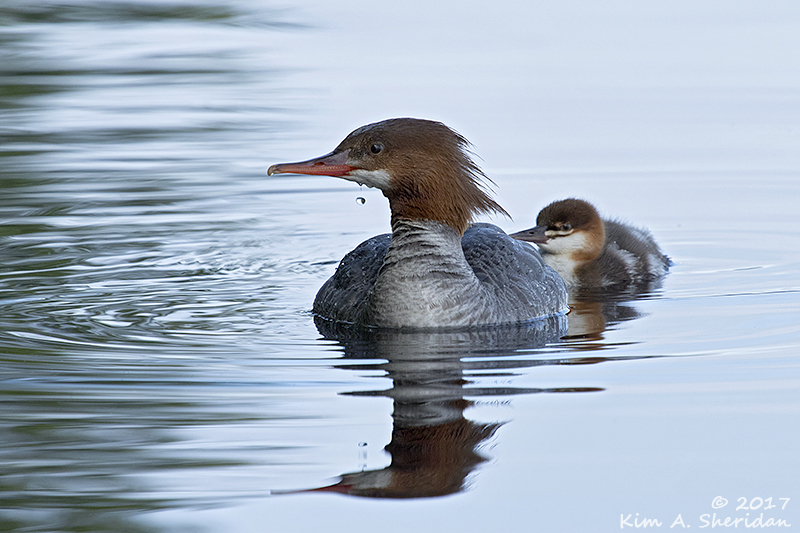 A Common Merganser swam into view. With her were five fluffy ducklings. Two got a ride on mama’s back, dozing sleepily, carefree. The others paddled along in her wake. I watched as the lovely little family passed in front of me and disappeared into the distance. I wondered where they were going? Maybe Mom knew a good diner for breakfast? 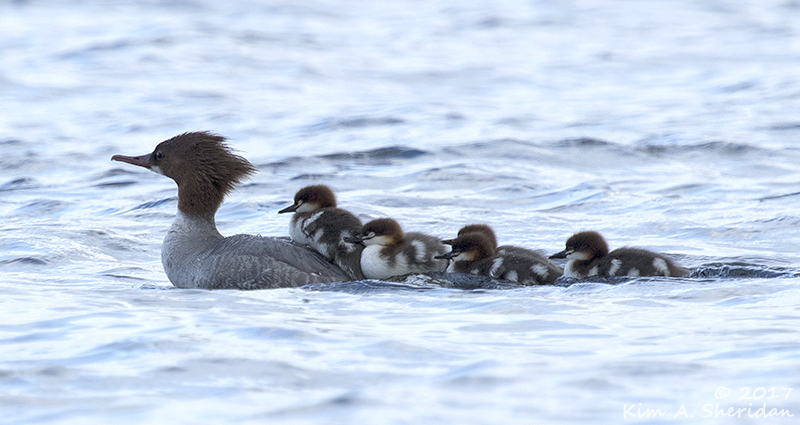 The Merganser story took a turn two mornings later, after a nighttime thunderstorm with winds and heavy rains. 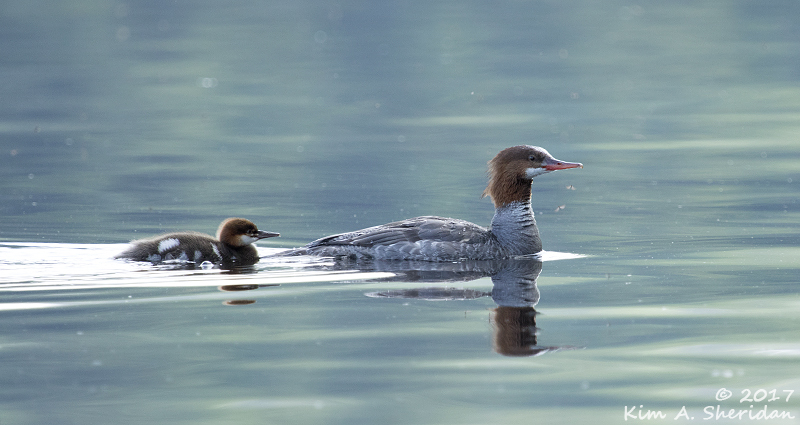 Now Mama Merganser returned – with just one duckling in tow. I told myself that the time had come for the other ducklings to be out on their own, or perhaps this was a different family altogether. But in my heart, I know that’s not so. Not all the young ones of any species survive their youth. But this young duckling was handsome and strong, and wonderful to watch. 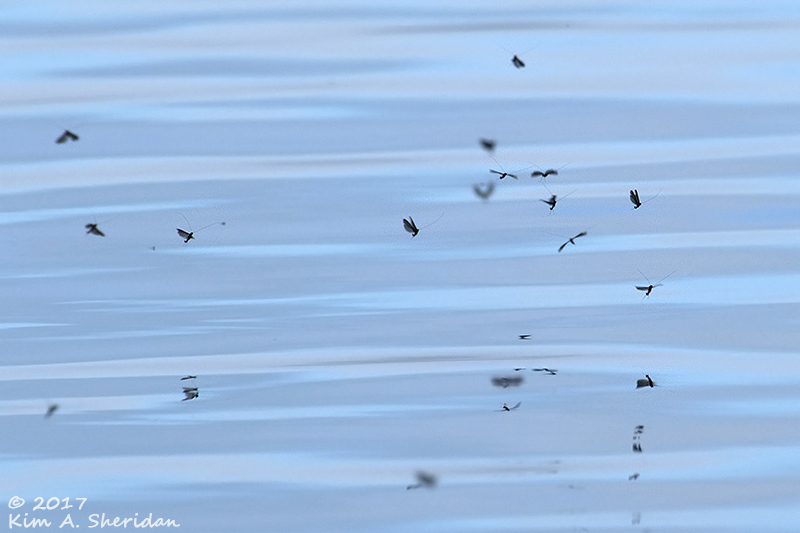 Above the water’s surface, the mayflies danced, carefree. 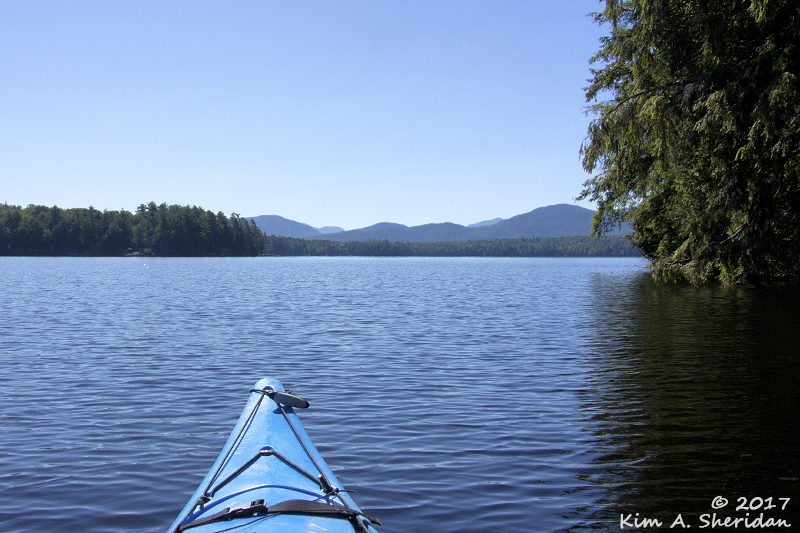 If there’s water, there must be kayaking… I’d dreamed for months about long solo paddles in the early morning or evening, sneaking up on loons, perhaps even catching a moose as it drank at the edge of the water. One look at the dock crushed that dream. I’ve yet to master the art of dockside kayak launches. Even with three of us, it’s a challenge. Alone? No, that wasn’t going to happen. However, my friends agreed to try the two kayaks out with me one still morning. And then, reluctantly, Robb. 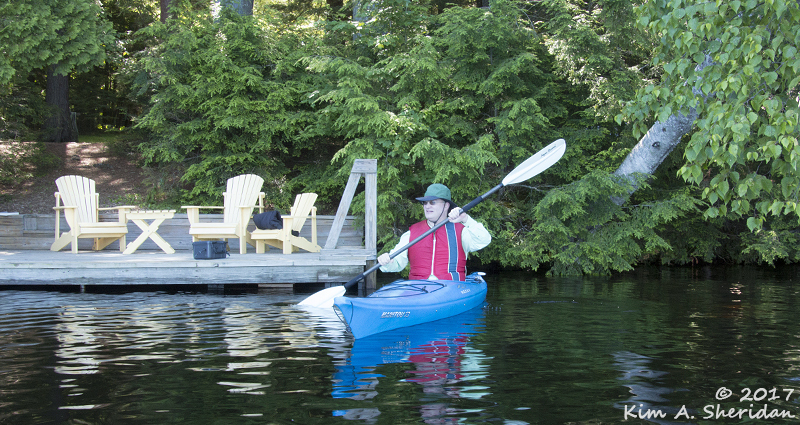 These kayaks were much narrower and longer than the boat he’s used to, and it took quite a while before he got the confidence to paddle more than two strokes at a time. Once he got the hang of it, though, he was the king of the lake. We weren’t out long, but it gave me the chance to get that obligatory view-from-the-kayak shot. Peeking around the point as Don paddles back to our dock. Bird feeders in the back yard drew lots of feathered friends. Some were birds we don’t get to see often. Rose-breasted Grosbeaks, Black-capped Chickadees (we get Carolina Chickadees) and lots of Purple Finches. Ruby-throated hummingbirds visited. Underneath the feeders, though? That was the domain of the red squirrels. The time was rare when there was no squirrel under the feeders. 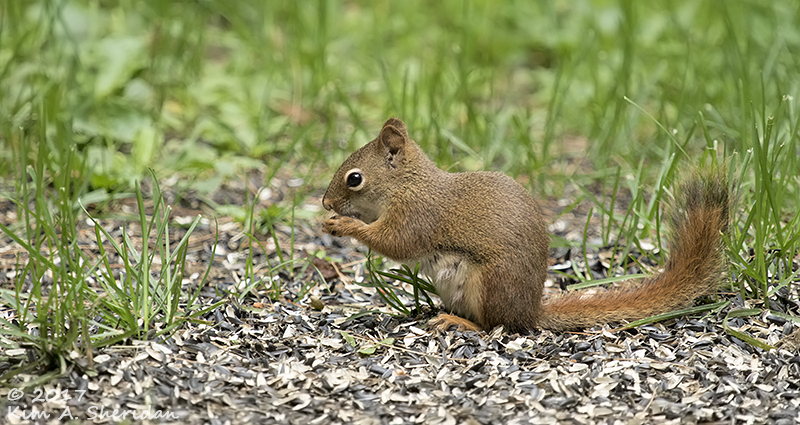 Not much bigger than a chipmunk, red squirrels are much smaller than our common gray squirrels. These jaunty little fellows have a white ring around their eyes and a black stripe along the side of their bellies. We never grew tired of watching their antics. Did someone mention chipmunks? Yes, they visited from time to time, too. 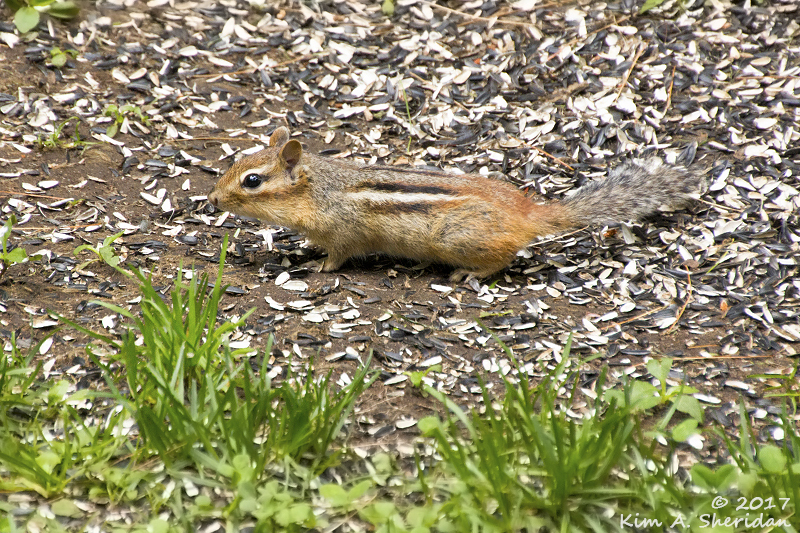 Tiny but fierce battles broke out between the two tribes when a chipmunk and a squirrel both wanted the prime real estate. 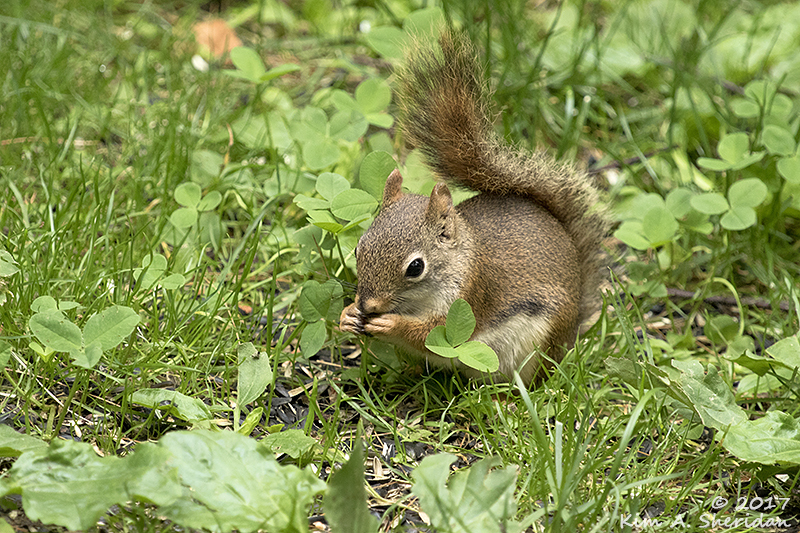 Surprisingly, these war games usually ended with the squirrel fleeing the chipmunk. 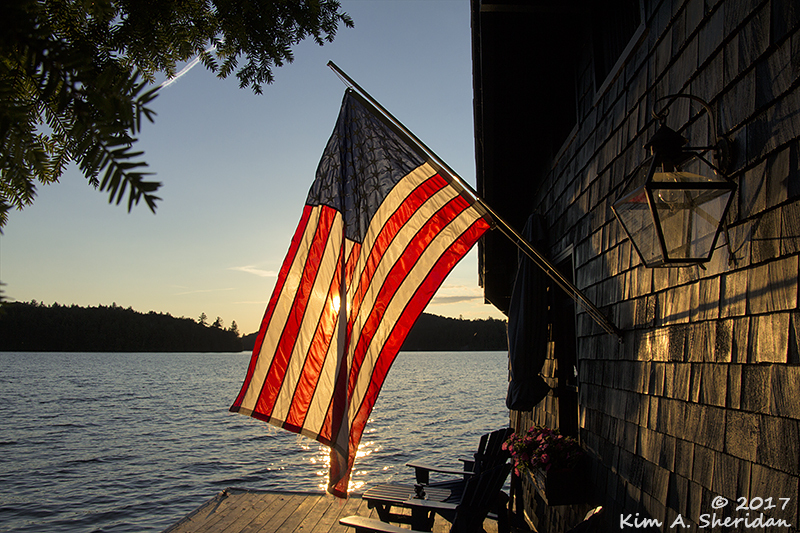 Each day ended lakeside on the dock, awaiting the sunset. Occasionally a highly polished classic wooden boat would motor by. 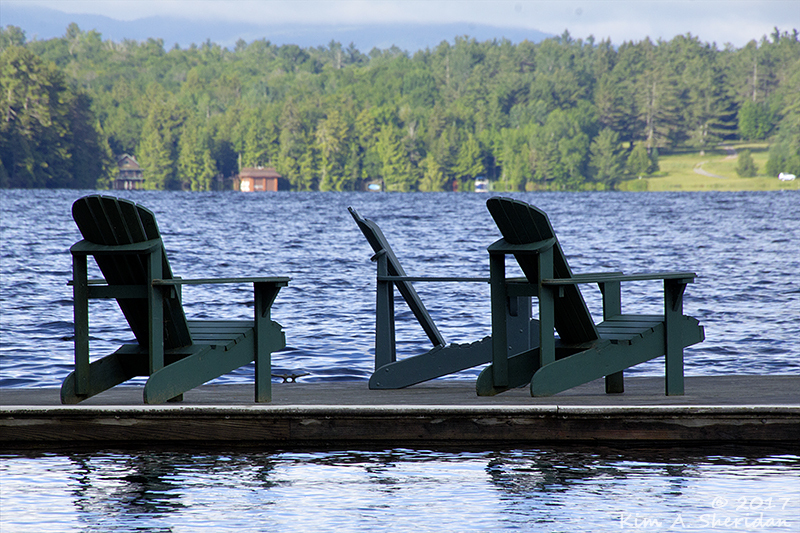 A classic Adirondack sight. We looked for the Milky Way one evening. We didn’t see it. Perhaps it was not yet dark enough. 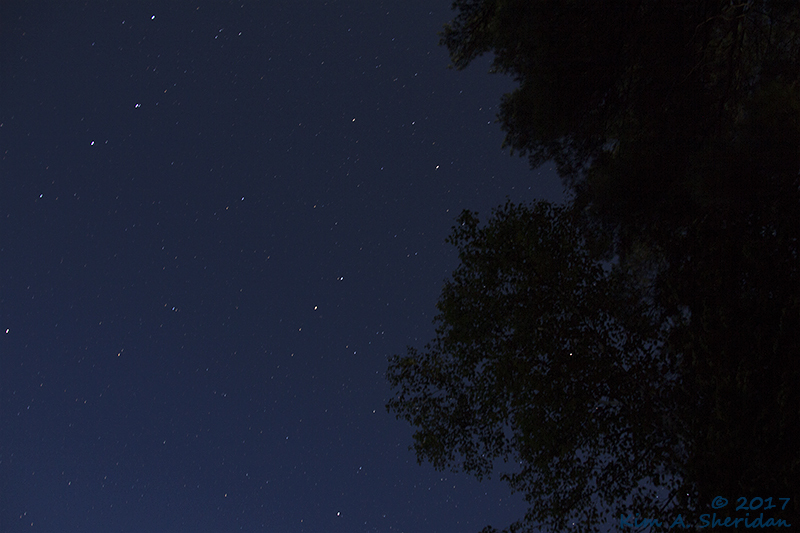 Still, there were an amazing number of stars. I can only imagine the sky in the middle of the night, when we were lost in our dreams, in our lakeside reverie. Oh! For the lazy lakeside living! We could have happily passed the days by the water’s edge, relaxed and carefree.